Movie free listed from 7 February 2019. 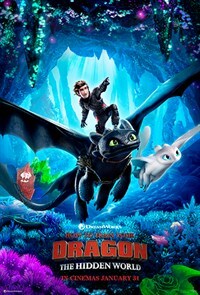 From DreamWorks Animation comes a surprising tale about growing up, finding the courage to face the unknown…and how nothing can ever train you to let go. What began as an unlikely friendship between an adolescent Viking and a fearsome Night Fury dragon has become an epic adventure spanning their lives. Welcome to the most astonishing chapter of one of the most beloved animated franchises in film history: How to Train Your Dragon: The Hidden World.